[Feature] What Defines a Port? It’s Time to End the Argument! When the Nintendo Switch made its debut last year, it was the talk of the town. It was the console gamers wanted and it was the console developers wanted to bring games to. Whilst not all of the games might have been brand new, or exclusive as a huge number of them have been ported releases, gamers were just happy to be able to actually play something they’re interested in. But then our praise for ports, took a bad turn, Nintendo announced more ports for the Switch and there are constant arguments regarding Super Smash Bros. Ultimate and Mario Tennis Aces, as to whether they are new releases or ports. However you may feel about the subject, we thought we’d try to get to the bottom of this matter, the best way we know how and that is by talking to 7 different publishers who have ported games to the Nintendo Switch. So, I hope your sitting comfortably because during this particular feature interview piece, you will be hearing from: Mikaël Bourget of QubicGames, Tom Crago of Tantalus Media, Adam Creighton of Panic Button Games, Philipp Döschl of FDG Entertainment, Matti Larsson of Zordix AB, Brjánn Sigurgeirsson of Image & Form Games/Thunderful Games and Adrian Vega of Ratalaika Games. Miketendo64: First and foremost, can you explain just what exactly a port is? Mikaël Bourget: It’s a game that was already available on another platform before. It has been made compatible to run on a new platform. Tom Crago: Certainly the definition can vary and no two are ever quite the same. Notionally a port is when you take code and art assets from an existing title and convert them so that they are compatible with different hardware. Adam Creighton: For me, a “port” is bringing a finished title from one platform to another platform after the game was completed for another platform, and is developed, finished, and released on the new platform after the first release. “Port” is a loaded word, for a few reasons. First, we as consumers have been burned with poor quality treatments of games that release later on additional hardware – “bad ports”. Game development is complex and hard, and I’m not going to feed the fire of blaming devs for versions of games that disappoint fans, when I don’t know what development, budget, publishing, or platform decisions fed into the eventual “bad” port. Secondly, consumers have an attachment to the platforms they own, and they want the things released for them to be special. So they’ll sometimes call a port on their platform of choice, not a port to elevate themselves, or they’ll call a game a “port” on platform they don’t own to reduce it to elevate themselves. That’s invalid, and is ego and pettiness and insecurity putting critical value on a product. But that’s the world we live in. Not that I have an opinion about it. Here’s a complicated example – I’m not sure I would call Wolfenstein II for Nintendo Switch a “port” in the traditional sense. We started Wolfenstein II before the game was completed, though it had been started before the Nintendo Switch was added as an additional release target. So then you get into, “How long between the same game releasing on different platforms makes it a port?” There is so much people outside the game industry don’t know about development and budgets and distribution and partnerships that makes that not as a straightforward as one might think. That’s why I go to that, “started, development, finished, released after the first release” kind of logic. Philipp Döschl: Technically, a port is when you bring software from a platform it has originally been written for to another. Depending on the case, you’ll have to adapt the code for different CPUs, rendering, I/O handling and potentially other things. Porting can be a piece of cake or hell on earth. Sometimes it might be easier to write a game or software again from scratch rather than trying to bend the code in order to make it executable on another system somehow. Depending on the programming language the software has originally been written in and on what the target platform’s supported languages are, you may have no other choice than rewriting everything from scratch. Matti Larsson: Very quickly, I would explain a port as remaking a completed game for a new platform. Traditionally, a port of a game can be very hard work. We ported a game called “Real Heroes: Firefighter” from Wii to 3DS some years ago. We then had to re-write all the low-level code in the Vicious Engine 2 with calls to Nintendo’s native code library for 3DS. At the time there was no support from Unity or other 3rd party engines either. Wow, that was really hard work, but our programmers learned a lot! Brjánn Sigurgeirsson: We ​have a very simple definition: if a game is already out for one (or more) platforms, making it available on an additional platform is a port. Adrian Vega: I would say a port is a conversion for any kind of software from one platform to another one trying to maintain the same functionality and usability. Miketendo64: Simple yes or no, should a game, let’s say a sequel, is built on the same engine as the last game, uses the same assets (say audio files, graphics and what have you) but has new gameplay mechanics, story and characters. Can this game be defined as a new game?? Mikaël Bourget: If it’s on the same platform as it was, then I would define it as an add-on or enhanced version. If you add new scenes, characters and gameplay features but keep some of the original ones and the same core mechanics, graphics and universe, then it’s less than a new game. If these new things are only there in the port on a new platform (and not provided to the original platform’s version), then I would define it as an enhanced port. Our studio actually released an enhanced port recently: In partnership with Vixa Games, we added in their mobile game “Jumping Joe” new game modes including a multiplayer one (2-4 players) and thus it became…”Jumping Joe & Friends” on Switch! Tom Crago: Yep, why not? Adam Creighton: This feels a bit constructed, and maybe I’m missing the point, but, “Yes”? With “let’s say a sequel” and “has new gameplay mechanics, story and characters” – That sounds like a new game. Brjánn Sigurgeirsson: Yes​, I think so. If it’s not the same game, it’s a new game. Adrian Vega: I think yes, right? If it would be a non-interactive media like The Simpsons, we would consider it a “new episode” but it’s the same characters, environments, art, etc. it just has a new story. Miketendo64: For clarity, where does a port end and a new game begins? By Structure, I mean the overall experience you offer (the main game modes, the main adventure (universe, story)). By Assets, I mean graphics, audio and specific gameplay mechanics. By Entirely new, I mean that there is no reuse of past stuff as they already were. By Reuse, I mean reuse of some past stuff as they already were + potentially some new stuff added to it. That’s my opinion and of course this table is too simple to cover everything, for example, FIFA 19 is considered a new game because they upgraded all the assets but in reality are the novelties not too highly-based on the previous ones, so much as to call it an enhanced version of FIFA 18? I don’t know, hard to say without being behind the scenes. I don’t have right now in my mind, an example of game who would reuse most of the assets as they were, but offer an entirely new structure. It should classify as new game but it would be interesting to think how new or “highly-upgraded” is this structure. Tom Crago: Gameplay is probably the key factor here. New gameplay generally equates to a ‘new game.’ It’s never black or white though. Quality and audience tend to be a reasonable guide as to whether a game was worth making. Adam Creighton: I think if a game comes over directly as-is, and adds nothing new for that new platform version, then maybe that is a “straight port” – though that is still a lot of work. Bringing a title over to hardware for which it wasn’t designed? Rewriting how rendering, memory management, jobs, CPU and GPU handling, etc. is done on new hardware? Using new platform libraries from everything from Trophies or Achievements to matchmaking to lobbies to friends management? Not trivial. If it’s not a sequel, where it becomes a “new game” is squishy, and you start to get into discussions about “definitive”, “deluxe”, “ultimate”, “GotY”, and other editions. Philipp Döschl: I think it’s pretty clear what a port and a new game are. Where it gets tricky are enhanced re-issue ports such as Mario Kart 8 Deluxe. It’s a previously released game that has been ported and new content and features have been added. Strictly talking, it’s neither new or a port but some sort of hybrid. Maybe the best-suited term would be a remake. Matti Larsson: A new platform for an existing game, with the same name as on other platforms, is normally considered a port, but it is indeed entitled to new reviews for the new platform. There are often many improvements and adjustments to the specific platform. Back in the day, up to 30% of the content would be different between platforms. Today the base content is very similar, although you will get a different feel and some advantages on some platforms depending on the hardware like extra screens and innovative controllers. A new game (that is not a port) is normally defined by its Game Title. You could in theory, as done in some cases, use a new title to describe the uniqueness of the game even if it shares assets with an original version. You can then (and you should) get a new chance with reviews for the improved new version. That is typical when making a game for a new platform. Brjánn Sigurgeirsson: ​See previous response: a port is exactly the same game (with MINOR additions/adjustments) ​as has already been released. For example, if we ever get done with the Xbox One version of SWD2, that would be a port. Adrian Vega: I think on the “maintain the same functionality and usability”, if you add new stuff it won’t maintain same functionality, the functionality will be extended. If you a just a little bit can turn into a “Special Edition”, “Deluxe”, etc. If you add a lot maybe it’s worth adding the “2” to the name. Also depends on the game, if its story based, or content based. Miketendo64: Although it’s fairly obvious, would you mind explaining why reusing assets from previous titles, can be a benefit? Mikaël Bourget: It depends on your aim. In the case of a port, the whole concept relies on reusing assets. A game is good as it is on a platform and you just want to have it as it is on another platform, so there is no point in not reusing the assets. You would lose time and risk losing essential components of the original title. If you want to make a new game on the same platform but you want to keep the same structure, then the only way is to make new assets. If you just want to make a new enhanced version or an add-on, then you should keep the same assets. Your aim is to provide players who love the original version some extra, not entirely new assets. Tom Crago: It often saves artist time. Although sometimes it’s easier just to build a model or texture from scratch, rather than play around with polygons or pixels trying to up-res. Adam Creighton: Making games (tech, design, art, testing, and more) is difficult and time-consuming. Re-using tech and assets in games amortizes that development investment, and it gives us better games by giving the next game a whole new starting point on which to build, refine, iterate, and innovate. It would be foolish to start over with new tech, tools, assets, and more for a successful game for which you’re trying to release a later, better thing that holds onto all of the good things of the previous game. As a gamer, if I like a game, I want the next thing “to be more of that thing I really enjoyed, with some new stuff”. If I play a game I love that took 4-7 years to develop, I don’t want to wait 4-7 more years for the next one, and in many cases, the business can’t absorb going without new revenue for that long. I selfishly want the new thing from that thing I enjoyed as soon as possible. Reusing tech, design, art, and more gets more of that thing I liked, and gets it to me sooner than it would if the developer had to start over. Philipp Döschl: Take series such as Yakuza on PlayStation. I’m pretty sure they re-used certain assets for later parts, which makes perfect sense as the game is always set in the same location. Staying in the Nintendo ecosystem, take Mario and his friends. I’m not sure how Nintendo develops games, but it would make sense to share certain assets across games (Mario Odyssey, Mario Kart, Mario Tennis, etc…) to save time and costs. It’d also make perfect sense for the sake of consistency. Looking at movies, probably the most well-known asset being re-used and re-re-used is the ‘Wilhelm Scream’. I can count the number of movies I’ve heard this scream till today. Re-using assets can save time, costs, help in consistency or just be a homage. Matti Larsson: We don’t normally use old assets at all in our new games or sequels. Only the knowledge in how to create a similar game. The graphics and processor hardware develops so fast that you need to re-make everything in physics, animation, graphics etc. One exception for us is online technology that in parts can be reused. It is of course, different in different studios. Brjánn Sigurgeirsson: ​I believe​​ we, to some extent reused sound effects from SWD1 to SWD2. That can be beneficial if – as in this case – the sound effects for, say, digging (a) are really good, to begin with, and (b) carry over a good feeling from the original to the sequel. Adrian Vega: Mostly due to reducing costs, if you can re-use engine or assets why will waste money making them new? Will that new rock in the background be any better if we re-do it? Will the game improve? Will players even notice it? The less budget you have the more you ask yourself this question! Miketendo64: And for extra credit, are there any negatives with reusing assets? Mikaël Bourget: As I wrote above or in the table, the negative is that you might not be able to consider yourself a new game. Tom Crago: Absolutely it can be more trouble than it’s worth. On some ports the publisher will give us a choice of re-using or building from scratch. Adam Creighton: It’s case-by-case for sure. Tech and assets aren’t future proofed, and unless they were planned for all possible hardware during development, changes are going to be needed for new opportunities. Maybe they don’t scale for the next version of the game on a new platform. For example, if assets were built for 720p, and, without being completely re-done, they don’t make the transition to 1080p or 4K. Most games don’t “magically work” if they weren’t designed for VR, and asset re-use might make that harder. And so on. Game engines for complex, aspirational games can be fairly purpose-built, and decisions are made for those previous games and their previous hardware targets that might not be valid for later game mechanics, product targets, or new hardware constraints and opportunities. Philipp Döschl: If the assets are of bad quality, sure. Or if they don’t fit the new game or they give a game the feeling of quickly being stitched together. To be honest, this is rarely the case and I’m having a hard time to remember any game where I’ve seen asset recycling abuse (talking of professional games of course, no matter if AAA or indie games, which are, like it or not, professional games as well). Matti Larsson: If you reuse very old assets you will not get the new possible AAA level of graphics or physics simulation quality. Both code and graphics have to be remade for the most important features. I wish we could reuse menu system code more, but in practice, it is often remade for every new game, again in order to reach a new level of quality. Brjánn Sigurgeirsson: Well, there’s ​the risk that players will feel “cheated” on the new experience if you reuse too much. All things can always be improved upon, and a developer can be considered lazy or even “greedy” if they don’t improve on assets from one game to its sequel. But upgrading an extensive amount of assets for a port may make the “early adopters” feel cheated. It’s good to keep a port as true to the original release as possible, I think. Adrian Vega: I think it depends on the point of view, if you cut costs, that’s a money that won’t go to someone or some company, maybe someone will lose his job, or just won’t be hired again. I think someone will always be affected, like when we decide to give our small bike to our younger brother cause it’s still good, the bike manufacturing company won’t get the money you would have to spend getting him a new one. Miketendo64: Lastly, if you are able to share it, what is your opinion on ports and Deluxe releases? Mikaël Bourget: – As a player, I think that ports are great. I don’t like platform exclusives, I like when a game is available everywhere. Same for Deluxe releases, if you love a game, why would you not like some extra? However, the problem with Deluxe is that they can fail and disappoint. A port doesn’t disappoint because it just works as it should (except technical fails like framerate drops or bad control inputs). A Deluxe release can be much more controversial: are the novelties really worth the price of this release? Each player can have their opinion…like for a new game. Regarding Deluxe release, I think they make sense if a game is popular, but in my opinion, they need to be done in coordination with a clear communication plan. So you need to be sure that you want to take the time as a studio to think about one and manage it. Tom Crago: Tantalus has shipped around twenty games that could be considered conversions (along with a number of original titles), including The Legend of Zelda: Twilight Princess HD on Wii U and Sonic Mania on Switch. I guess we would be considered among the best in the business at reimagining old titles, so my opinion is overwhelmingly positive. Nostalgia is a big factor in video games. We want to relive past experiences, only better and brighter than we remembered them. Adam Creighton: I want to play the games I want on the hardware I want when I want, and I really appreciate when they’re special for the hardware on which I buy them. 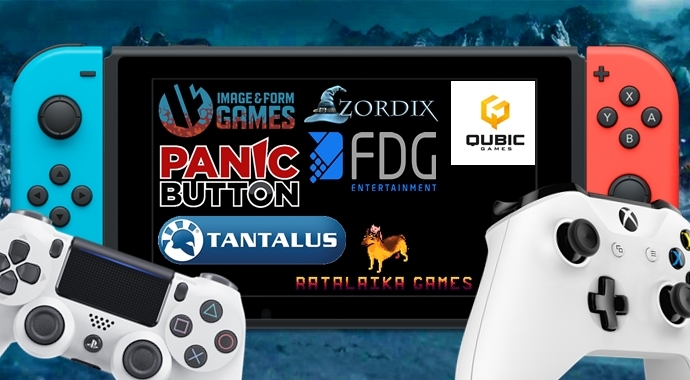 Those are the games Panic Button tries to build, and why we turn down a lot of projects. Do I now get to play a game I didn’t get to play because I didn’t have access to that hardware when it was first released? That’s cool. Does the game on the new platform include features or content the developer wasn’t able to get to on previous platforms because of time or budget constraints? Very cool. Does it include unique content as a reward to fans who buy or re-buy it on that platform (custom cars in Rocket League)? Very, very cool. Does it wrap in all of the previous game, months of fixes and updates, all DLC, includes previously platform-specific content or features, adds or amps the art or other assets, and makes that all seamless and easy for me in one complete package, and at a reduced price? Cool cool cool. At Panic Button, we don’t “port” per se – We re-target games to new platforms, and that is not a terminology spin. Re-targeting is a mentality we have that informs our development process and work and drives us (wherever feasible) to make the game special for its new home, and for its new gamers. Philipp Döschl: As long as they’re done in a good way and not just to rake in (tons of) money, or even worse, a technically bad performing port, I’m totally fine with them. What would Switch be without Mario Kart 8 Deluxe? I’m pretty convinced Nintendo didn’t have a different choice than going this way, otherwise, Mario Kart would have been released sometime around Christmas this year or even later. MK8D is a good example of a re-issue port, or rather a remake: they ported the old game, improved what was not good in the previous release, added new content, et voilà! Here comes the best Mario Kart since Mario Kart 64. Don’t forget that ports or DX releases also allow people to play games they’ve missed on an earlier generation, now being adapted to the current generation. How many people out there are longing for a Final Fantasy VII remake to current generations, with HD graphics, cinematics, etc…? The original game with nowadays visuals. Matti Larsson: Ports are generally a very good thing, since you can adapt to the new platform and improve on a game that is already good. I would love Nintendo to make more Deluxe releases on Switch for their ingenious Wii U titles. There are so many great games there that deserve a bigger market. For me, the term “Deluxe” means you will get a polished improved game, and that can’t be bad, right? Brjánn Sigurgeirsson: ​Ports are the exact same game as released earlier. A “deluxe” version should definitely also contain more and/or different gameplay. For example, we released SteamWorld Heist on the 3DS at $/€20, and then we lowered the price to $/€15 after a good while (after having released three DLC packages ($/€5, $/€2, free) for the game and ported both the game and its DLC). When we released SWH for Switch we decided to include all DLC packages in the main game and charged $/€20 for it. Since this was the ultimate edition of SWH, we decided to call it just that: SteamWorld Heist Ultimate Edition. That’s a perfect example of a deluxe release. It’s $/€5 more expensive than other platform releases, but on the other hand, the Switch version contains much more. In fact, by comparison, the Switch version is $/€2 cheaper than if you were to buy everything for the game on any other platform. Adrian Vega: I think it mostly depends on the case, if your Deluxe or port version is justified or not. If you are porting a 10 year old game with almost no fan-base to a new system and don’t improve it at all, is it correct? I guess it depends maybe it was done to try to get more fan-base or maybe in a greedy attempt to cash out. It’s quite hard to know, I think if we do a good work and think about the players 1st not our own pocket it should be okay. A huge thanks goes out to Adam, Adrian, Brjánn, Philipp, Matti, Mikaël, Philipp and Tom. Your answers were exactly what we were after and we hope they help bury the constant port arguments, once and for all!